Freedom’s Frontier National Heritage Area is a forty-one county region in eastern Kansas and western Missouri. 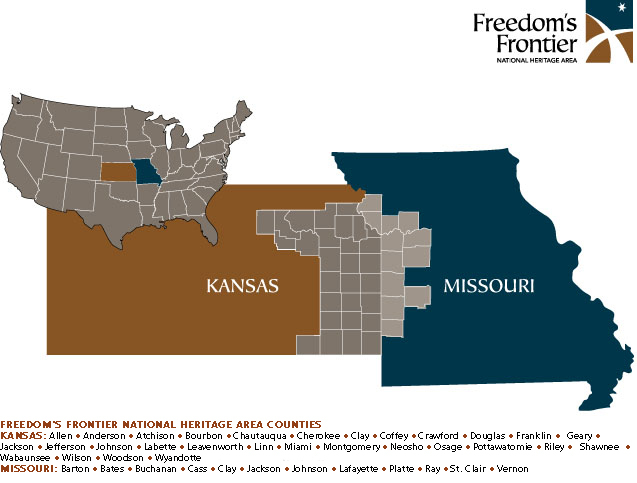 Designated by Congress in 2006 as a National Heritage Area, Freedom’s Frontier was recognized for its significant story of the Border War fought between Missourians and Kansans prior to and during the American Civil War. Freedom’s Frontier unites concerned citizens from around the region in a grassroots effort to steward the cultural landscape and its nationally significant story about the struggle over freedom on this frontier. FFNHA works to build partnerships, provide resources, enhance historic landscapes and stimulate economic development to bring attention to our nationally important story.